I have baked some mango cakes before, like the 5 MinuteChocolate Cake in a Cup eggless mango cake and mango marble cake.This Today's recipe is very quick and delicious Mango cake in less than 2 minutes. This recipe looked pretty interesting. Yes, seriously This cake in a coffee mug that cooks in the micro in just 2 minutes. you can enjoy this super soft n yummy cake instantly with very less and basic ingredients along with some Mango pulp I made some changes in this recipe I didn’t use egg then instead of oil I used unsalted butter. It turns out good. My children loved it!. 1.In a mixing bowl, Sift All-purpose flour, salt, baking powder & baking soda together and keep aside. 2.In a another bowl, add Mango Puree,milk,butter vanilla extract and sugar mix everything well. 3. Now add the flour mixture to it and mix gently. 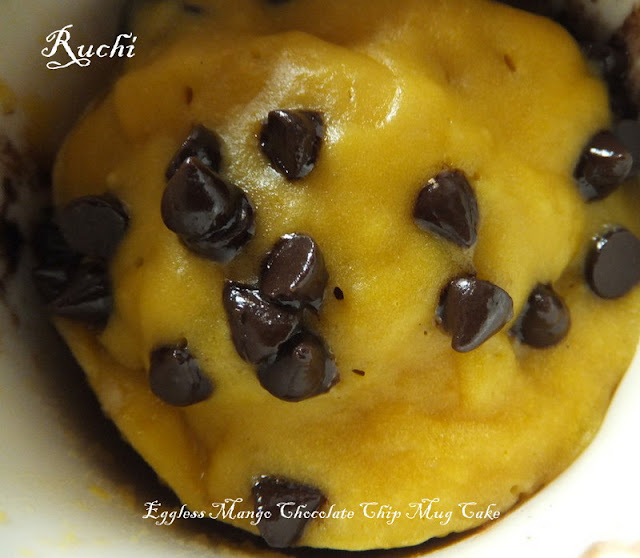 Fold in 1/2 tablespoon of the chocolate chips into the batter and reserve the other half. 6.Place it in the microwave and cook for 1 minute on high. Remove, tap it lightly and put it back for 30 seconds more. 7.Let it remain for a minute inside and serve immediately after. 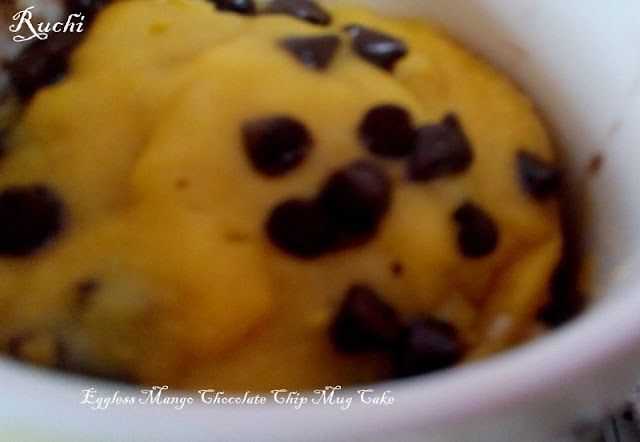 Enjoy delicious soft mug mango cake! Better when served warm right out of the oven!